The Cayman Islands are a British overseas territory located in the western Caribbean Sea. The territory is comprised of the Grand Cayman, Cayman Brac, and Little Cayman islands, which are located south of Cuba and northwest of Jamaica. The territory is a major offshore financial centre in the Caribbean. There is no direct taxation imposed on Caymanians, nor on Cayman Islands companies. A 10% government tax is placed on all tourist accommodations in addition to the small fee each tourist pays upon arriving onto the island. Soccer is the Cayman Islands’ national and most popular sport. Cayman Islands Dollar. It is the 9th highest valued currency unit in the world and the highest valued dollar unit. 110/120 volts, 60 cycles the same as in Canada. You can find high end designer clothes in the shops and the prices are comparable to those found in Canada or the US, just minus the sales taxes – so, there aren’t any great bargains. However, best buys are on goods imported from Great Britain and Europe, such as china, crystal items, woolens and linens – particularly in the spring when the stores are clearing out their winter inventory. Also look for rum-based liqueurs and delicious locally grown honey. The Cayman Islands have more registered businesses than they have people. Cayman Islands enjoy mainly tropical weather conditions with slight seasonal variations. Climatically, the year divides into two seasons – the summer or rainy season (generally from mid-May through October) and the dry, winter season (from November to April). The winds are mostly from the east-northeast in winter and east-southeast in summer. The temperature in the Cayman Islands, summer or winter, seldom goes lower than 21°C or higher than 32°C with the daily average varying between 25°C and 29°C. The average relative humidity is a comfortable 77%. The water temperature averages 27°C throughout the year. Seven Mile Beach is a long crescent of coral-sand beach on the western shore of Grand Cayman island. The beach is world renowned for its beauty, recently receiving the honor of "The Caribbean's Best Beach"" from Caribbean Travel and Life Magazine. 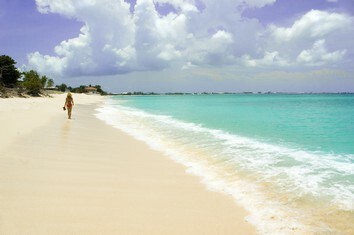 It is the most popular and in turn, the most developed area of Grand Cayman." Pedro St. James Castle or Pedro's Castle is the oldest existing structure in the Cayman Islands. The castle was constructed in 1780 as the home of William Eden, and 50 years later it served as a rendezvous point for the first elected parliament in the Cayman Islands. It is therefore known as the birthplace of democracy on the islands. Cayman Brac is an island that lies about 143 km northeast of Grand Cayman in the Caribbean Sea. Its terrain is the most prominent of the three Cayman Islands. "The Bluff"", a large central limestone outcrop, rises steadily along the length of the island. The island is named after this prominent feature, as ""brac"" is a Gaelic name for a bluff. " The three islands of the Cayman Islands are the exposed top of an underwater mountain. Underwater, the sides of this mountain are quite steep and vertical in some places. In addition to the expected coral reefs, colorful fish, and other underwater creatures, this "wall diving"" provides something extra-ordinary for scuba divers." Hell, Grand Cayman is a group of short, black, limestone formations in the northwest Grand Cayman town of West Bay. It is roughly the size of half a soccer field. People are not allowed in amongst the limestone formations but two viewing platforms exist for tourists. The oldest Christian congregation in the Cayman Islands, Elmslie United Church was established by accident. Rev. Hope Waddell, a Presbyterian minister from Jamaica, was a missionary en-route to Nigeria when his ship wrecked on a reef off the Cayman Islands. Waddell established this congregation and others in 1846. The turtle farm on Grand Cayman is a great place to see sea turtles of all shapes and sizes. All love to see the turtles up close. Turtle Farm of Grand Cayman is a research and breeding farm housing five species of green sea turtles. It provides a large export business for the island, but it also has helped to preserve the turtles from extinction. A visit to Grand Cayman's Butterfly Farm is an unforgettable encounter with nature in all its beauty and diversity. Step into a tropical garden teeming with butterflies from around the globe and prepare to meet some of thw world's most colorful creatures. Observe the life cycle of these fascinating animals from egg toa butterfly. The Cayman Islands National Museum is a museum in the Cayman Islands located in the Old Courts Building on Harbor Drive on Grand Cayman island. The museum is dedicated to the preservation, research and display of all aspects of the Caymanian heritage. Little Cayman is the smallest of the three Cayman Islands, a British overseas territories, both in area and population. It is located in the Caribbean Sea, about 87 miles (140 km) northeast of Grand Cayman and five miles (8 km) west of Cayman Brac. Most of the island is at sea level and it is famous for scuba diving.